Could someone explain how to calculate the expected amount of ether mined for a given hashrate and network difficulty? And also https://stats.ethdev.com/ seems to suggest difficulty is around 21e9 in the testnet, is that correct? How many ethers one is expect to mine in an hour with a hashrate of 25MH/s , current difficulty or a bit more since more users coming. Total noob here, I'm just guessing! 5 Ether per block during frontier apparantly. The calculation below is ignoring uncles, it's just for the static block reward. So after a day you can expect on average yourHashrate / totalHashrate * etherPerDay. The stats currently state 3.1 GH/s as the total hashrate. Then again, I'd estimate the total hashrate to be maybe a hundred times higher when more miners run their rigs. 24*60*5*(25e6/3.1e11) = 0.58 Ether / day. Still open is the question of how likely it actually is to mine at least one of the 1440 blocks each day. If I'm not mistaken, then the geometric distribution applies when asking for how long to wait for a block. Isn't block propagation expected to be closer to 12 secs? Let's say, to stay conservative, it's every 24 seconds, this means 3600 blocks/day. So 24*60*2.5(block propagation)*5(Eth block reward)*(YourHashRate/NetworkHashRate). Or is it just not not conservative enough to estimate assuming a quick block time? 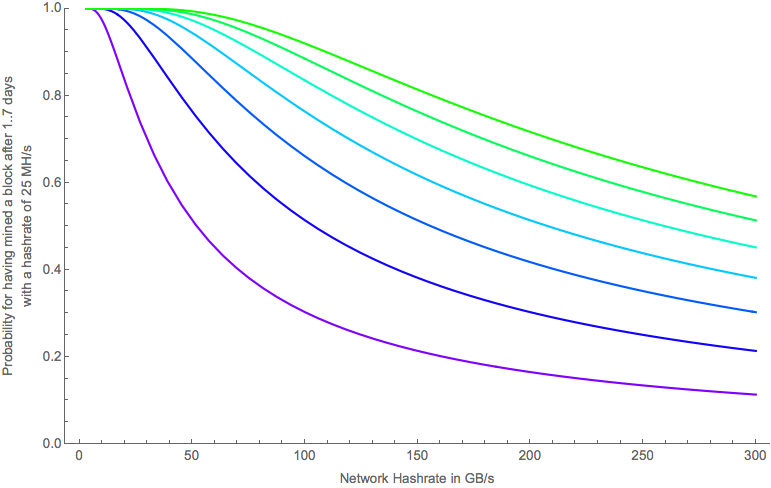 I also put together some rough [graphs on profitability](http://spacience.blogspot.com/2015/07/ethereum-profitability-basics.html) based on Ether value, Your hash rate and network hash rate.